The Spike is a weapon pared down to its bare essentials. Its thick, narrow blade is distal tapered and flat ground to a zero edge. The integral handle of The Spike compliments its minimalist theme. It has been carefully shaped out of solid steel, wrapped with cord and had all of its sharp edges melted so they don"t irritate the hand. 4" blade, 8" overall. Without a doubt the best neck knife I've ever owned! It's a little skinnier looking in person, but has an amazing edge. 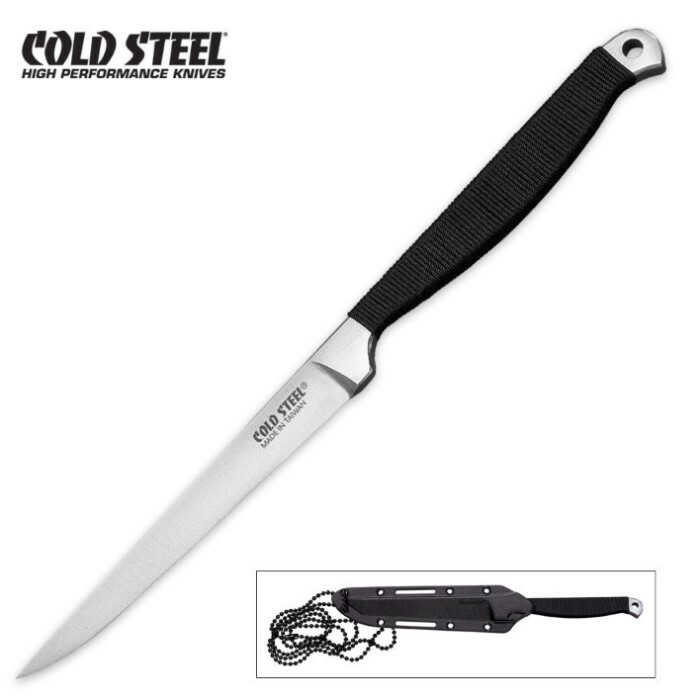 This knife is ALWAYS sharp and is virtually indestructible. Only minor problem is the sheath started splitting and you can lose your knife if you wear it as a necklace....but it only fell out when I was free running so it stays in its sheath otherwise.